his past month I have also been working on a commission from the nuns of St Benedict’s across the street. This year is the 100th anniversary of the College of St Benedict’s, founded by the sisters. To celebrate it, the sisters who run the Whitby giftshop and gallery on campus, have asked me to make some commemorative pendant necklaces for sale in their giftshop. Fun huh? 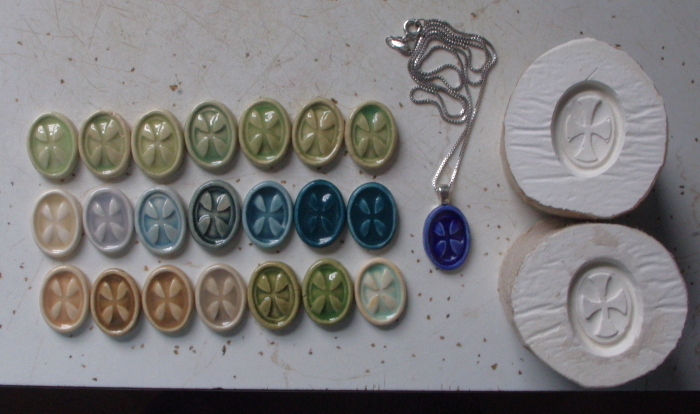 Above is one of the necklaces we’ve been designing, with a slew of glaze tests, and the plaster molds I made for them. To make the molds I used a toilet paper tube as the outside container, wax paper, and clay as a sealant on the edges of the mold. I made a “positive” image of the pendant just as I wanted it in clay, wet the back with water, and stuck it to a piece of wax paper. Depending on what you are making, mold-makers will often put a coat of Murphy’s oil soap on the form of the mold as a “release”, so that you can get the plaster mold out of the form you built for it. Since I didn’t mind having a little cardboard from the tube stuck to the plaster, and the wax-paper would resist the plaster by itself, I skipped this step. If brushing your clay positive with oil soap will damage details in it’s surface, you can spray it with WD40 or cooking oil as a release. I would stick the positive securely down to the base of your mold, before spraying it with WD40, lest you get some on the back and it then won’t adhere well enough to the mold. You can use clay or silicone to seal up the edges on your form for the mold. I only had the one edge running along the bottom of the tube to worry about, and sealed it from the outside only with a coil of clay. When building a box form for a mold I have sealed all eight edges with clay. Then I mixed up some plaster in the ratio recommended on its package, poured it in and thirty minutes later, voila! Mold making provides some pretty instant gratification. I used Plaster of Paris this time, in the past I have used “pottery plaster”. Both worked fine. When working with plaster, remember not to put any! wet plaster down the drain of a sink as it can set up and clog your plumbing. Wash the plaster off all utensils and containers in a large amount of water (5 gallon pail) immediately after use. Let this sit a day before dumping down a drain. I allow unused plaster that I have mixed up to set up completely in a waste container (plastic food container) before disposing of it. Also, do not allow plaster bits to get into the clay of a ceramic piece. Or else, when the clay is fired, the expanding plaster will blow out a chunk of your piece. The last photo is of some prototypes of the other style of pendant we’re designing. /\ We are leaning towards the far right one, and going for simplicity.